Served it on pasta with chicken and broccoli; very tasty. Preheat oven to 450°F. In a bowl, mix first three ingredients until thoroughly moistened. Drop by tablespoons onto a greased baking sheet (or in a greased muffin tin). Combine rest of ingredients and brush mixture onto biscuits. Bake for 8-10 minutes or until lightly browned. A tasty and reasomably simple chicken recipe from Martha, adapted for my taste and the chicken I had. I didn’t use the large, whole breasts she specifies (which seem scary big – are US chickens larger?) but the kind of ordinary single boneless chicken breasts you buy in the supermarket (four single breasts). This was a plentiful amount for two, which was served with roast potatoes and a salad. 1) Preheat oven to 200C / 400F. Rub garlic half with oil. Place each garlic half, cut side up, in the centre of a roasting tin (I actually baked this on the rack above the roasting tin while the tin itself held the roasting potatoes, and it worked well). Place two sprigs of oregano over each half. Rub chicken breasts with oil and salt and pepper to taste. Place a chicken breast over each garlic half. 2) Roast for about 30 minutes (if you do roast potatoes with, let them roast for 20-30 minutes before adding the chicken so they crisp up), or until juices run clear and meat is cooked through. My spin on chai, minus the tea aspect. It’s a great, relaxing drink for getting yourself to sleep, and I prefer it to drinking warm milk straight. I’ve given quantities below for whole spices and estimations for substituting whole spices with ground. Don’t stress out about crushing the spices – just whack them with a mortar (or a mug) and throw the shards in. Also, sometimes, if I don’t have any ginger to hand, I grind in a bit more pepper for that fiery kick. 1) Place milk and spices into a saucepan. Place over low – medium heat (depending on your patience!) and bring to a boil. Remove from heat (you don’t want it to boil over!) and strain. Mix in honey to taste and serve. Fried chocolate sandwiches! I place all blame on epicurious.com for this one! I made the “student version” with the bread I happened to have around and chocolate chips, and it was still delicious. These were both simple and delicious. I adapted the original recipe a little to be more convenient for me (e.g. it’s not easy for me to use only eggwhites, so I used a whole egg). It was very tasty and a delicious and super-simple accompaniment to some stuffed baked peppers (recipe soon!). It would also be a really nice side to something like roast or meatloaf. Preheat oven to 220 degrees celsius. Oil a baking sheet. Toss the potatoes wedges into the beaten egg (you may need more) and place on baking sheet. 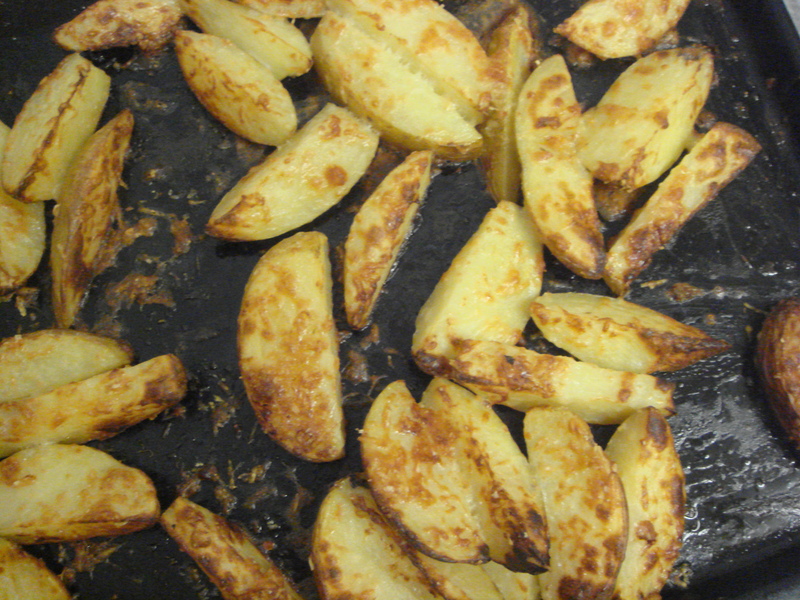 Sprinkle parmesan over the wedges and bake until the potatoes are soft, about 30 minutes. No photo because we devoured this. The lasagna recipe below is a take on this one, which I changed slightly to take into account different ingredients and to serve more people. We are clearly hungry people, because my version, which virtually doubled the recipe, was shared between four. As to the baking medium: Martha recommends (for her recipe, which is half of mine) an 8×8 inch square baking dish. I used a large round casserole dish which was very deep. Combine cottage cheese and 1/4 cup parmesan in a bowl. Remove noodles from baking dish. Discard water. Spread about 1/3 of the meat mixture in the bottom of the dish and cover with noodles. Spread 1/3 of the cheese mixture over the noodles. Do this twice more (1/3 meat, noodles, cheese each). Sprinkle with mozzarella and remaining 2 tablespoons parmesan. Bake for about 30 – 35 minutes, until lasagna is bubbling and cheese topping is golden. Let stand about ten minutes before cutting and serving. Eat well…because life is too short not to! These are delicious, but I haven’t yet perfected the art of making them look pretty, so there’s no photo yet. Bake the potato in its skin until soft. Halve the potato while still warm and scoop the flesh out of the skin and place it in a bowl. Drain the tuna and add that to the bowl along with the melted butter, onion, and salt and pepper (and parsley and lemon if using). Add about half the beaten egg. Mix the whole lot together with your hands squidging up the chunks of potato and tuna, but leaving the mixture slightly rough and uneven. If it isn’t sticking together (but isn’t overly runny) add more egg ’til the mixture sticks together. Divide the mixture into quarters. Dust hands with flour and shape each quarter into a cake ½-3/4 inch thick. Coat each in flour. Fry in butter and oil until brown and crisp. Serve with tartar sauce, salsa cruda, or salsa verde. Dice all, let sit and meld in refrigerator. These are just as good, if not better, than the French Fries you’ll get in most restaurants. And they’re easy! Dilute the Ceasar dressing with olive oil until it is the consistency of a vinagrette. 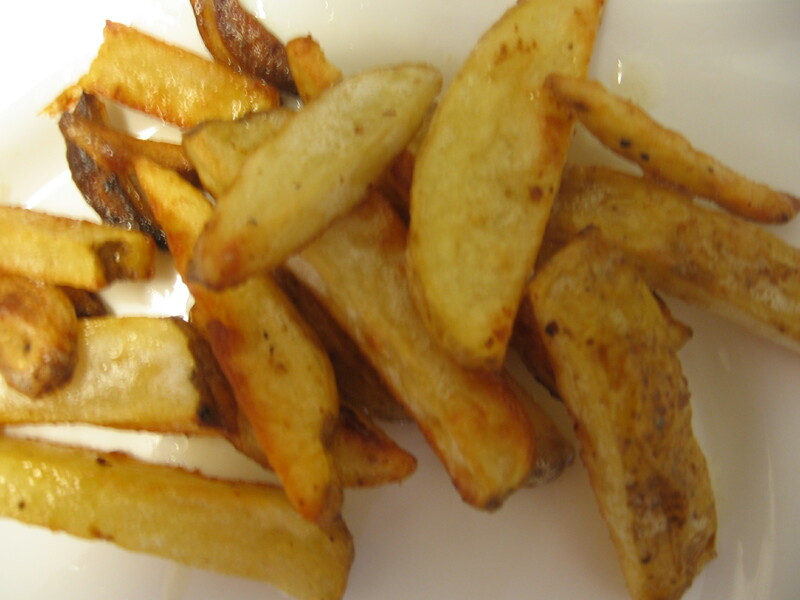 Coat the potato wedges and garlic slices in the mixture, and add salt and pepper to taste. Bake at about 200 C for about an hour, or until the potatoes are golden and crispy.